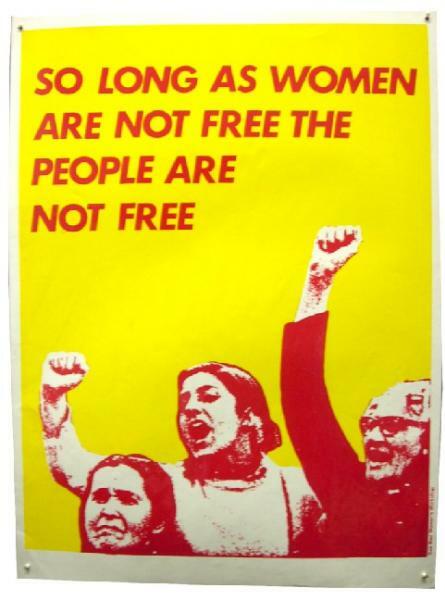 See Red Women's Workshop was a screen-print workshop run as a women's collective between c 1974 and the early 1990s. It was a radical campaigning and publicising organisation fully committed to the ideals of the second wave feminist movement. See Red's activities included the designing and printing of their own posters, postcards and calendars, as well as taking on design and print commissions for other organisations. They also gave talks and demonstrations on screen-printing. Their work was distributed through shops and mail order both nationally and internationally. The group varied in number; overall 25 women worked at See Red during its lifetime. After working from home in the early days, the collective progressed to renting shared space with Women in Print, at 16a Iliffe Yard, off Crampton St, London, SE17. The workshop was initially run without grant-aid, and the women contributed up to three working days a week to the workshop while earning a living elsewhere. In the early 1980s the collective was supported by funding from the Greater London Council. The women were committed to the principles of working as a collective in spite of time and money constraints. They saw themselves as accountable to the Women's Liberation Movement, and wanted to design posters that were cheap and therefore accessible. They were keen to prioritise the strength of the message over slick techniques or beautiful art, making posters that served an urgent purpose that they acknowledged might ultimately be short-lived. The posters carried either a campaigning or a consciousness-raising message, and treated many subjects including: women and sexuality, health, childcare, domestic politics, domestic violence, sexual equality for girls and women, male sexist attitudes, sexist and degrading treatment of women by the media, and oppression of women in a wider political context, both nationally and internationally. The Workshop finally closed in the early 1990s. - Notes from The Women's Library, London, which holds archive materials on See Red. Submitted by jessbaines on Thu, 02/19/2009 - 13:06.